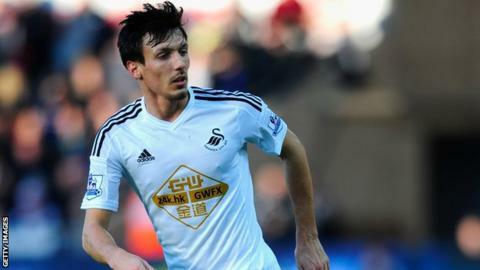 Jack Cork insists Swansea City's season is not over with the midfielder targeting a record Premier League points tally. Swansea remain ninth in the table despite a 2-0 defeat at West Bromwich Albion which manager Garry Monk described as "very poor". Cork, 25, who joined from Southampton in January, denied the side had become complacent. "We've got to try and get as high up in the table as we can," Cork said. "We're ninth in the table and have got loads to play for. "When I came in and spoke to the manager he said we want to try and get the best ever Premier League finish we've had. "We aren't getting complacent and the [West Brom] result is hopefully a little slip and we'll pick ourselves up for the next one." Swansea City set their record Premier League points total is 47, in their debut season in the division in 2011-12. Their highest Premier League finish is ninth set in 2012-13 with 46 points. Monk's side currently occupy ninth spot in the table, 12 points clear of the relegation zone, but are not seen as realistic contenders for a place in next season's Europa League. The Swans were knocked out of the FA Cup in the fourth round at Blackburn Rovers and are without a game this weekend. But Cork, who began his career as a trainee at Chelsea, believes a break will benefit himself and his team-mates following their defeat at West Brom. Swansea face Manchester United at the Liberty Stadium on 21 February looking to complete a league double over Louis van Gaal's side following an opening day win at Old Trafford. "We've got a few days off to think about it and we've got a good week's training to lead up to it," Cork added. "Sometimes you want to get straight out on the pitch and try and put it right. "For me personally it will be good to have a week training with the lads and go from there because I haven't really trained yet. "It will be good for me to get a good week's training with the lads and go again with United. "A big team like that at home is a game we will think we can nick something from and hopefully that will get us going again."